Situated right on Lemon Bay and across the street from the Gulf of Mexico, this one bedroom condo is ideal for singles or couples wanting a peaceful and relaxing getaway. This property is one of only 9 condos sharing a heated swimming pool, BBQ area and dock where you can fish, moor your boat/jet ski, or simply relax and enjoy the beautiful views. 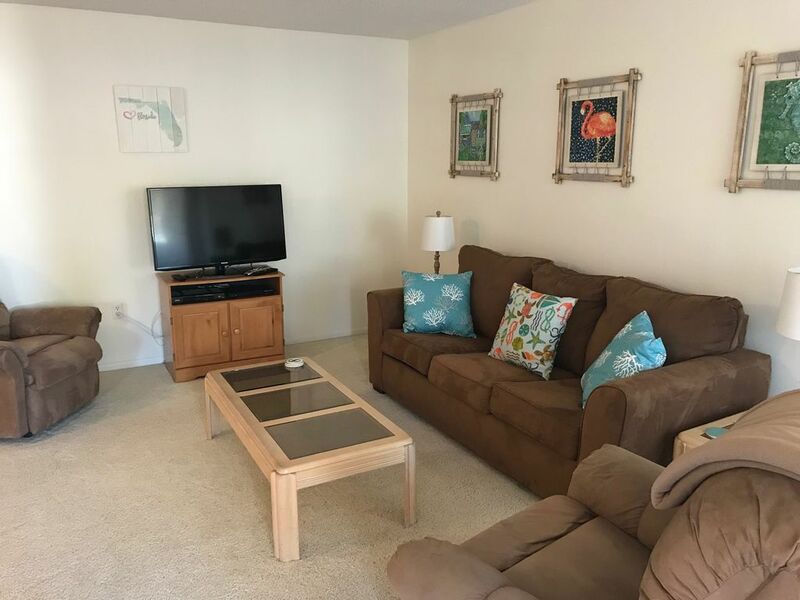 The condo has everything you will need including a lanai with sitting area, living room with 42 inch Smart TV, hi-speed wi-fi, bedroom with king-size bed, bathroom with tub/shower, fully equipped kitchen, dining area, washer/dryer, linens and towels. This condo is half a mile from Englewood Beach and 10 minutes drive to Olde Englewood Village and Dearborn Street with many restaurants, antique shops, arts and crafts and festivals including 'Cruisin' on Dearborn'. There is lots to do in the area including fishing, watersports, golf, shopping, and live music, as well as relaxing and searching for shark's teeth on the beach. Sarasota is just 40 minutes away, Tampa 1.5 hours away, Orlando approx 2.5 hours away and Miami approx 3.5 hours away. Dominic and Kate are from the UK, and moved to Florida in 2018. They have owned this condo since 2011, and love enabling people to experience this piece of paradise. They live close by in Venice so can be on hand for anything you may need. Dominic is a School Teacher, and Kate works as a Realtor and Travel Agent. This condo complex is unique in that there are only 9 units all on one level. During the high season, when most units are rented, people can have the perfect balance of seclusion and social activity. Throughout the rest of the year, this property cannot be beaten for its peacefulness when you may often have the pool and dock to yourselves. Sitting by the pool, watching the jumping fish and dolphins swimming by cannot be beaten - it truly is a piece of paradise. This condo is cozy and comfortable, and with brand new appliances installed in 2018, you will have everything you could need. The kitchen is fully stocked, and everything is provided for your use. Being just one unit from the pool means you have easy access and a great view of Lemon Bay from the lanai. 42' High Definition Smart TV. Pool located immediately outside condos, shared by 9 condos. Came in for 3 days to visit friends. Never been to this Key before. Very nice, would highly recommend. Condo was clean, bed was comfortable, and nearness to activities was nice. This a great condo in a wonderful location! It was very cute & clean! Kate was so very helpful & accommodating! Would definitely stay again! We had a lovely time visiting Manasota Key. This condo was an excellent find and Kate was very responsive when we needed to communicate. The heated pool was an excellent perk as well as the dock on lemon bay. Excellent facility! Could not ask for more. Located in the peaceful paradise of Manasota Key in Englewood, Fl. Situated on Lemon Bay where you can kayak, jet ski, go boating, fishing, or just watch the dolphins and wildlife. Across the street from the beach and walking distance from amazing restaurants and bars. Everything you could want from your getaway on Florida's Gulf Coast! 20 minutes to Venice, 30 minutes to Boca Grande, 45 minutes to Sarasota, 1.5 hours to Tampa, 1 hour 45 minutes to Naples, 2.5 hours to Orlando, 3.5 hours to Miami.